PNY reveals the XLR8 GeForce GTX 680. This reference based model includes a 16ft smart active HDMI cable but has a MSRP of $529.99, although the firm does offer a $30 mail-in-rebate which takes the price to the standard $499.99. 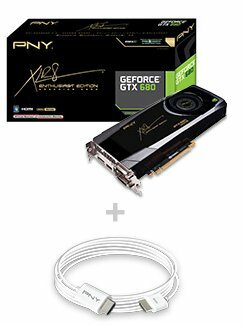 PNY Technologies®, Inc. (“PNY”) today announced the release of the much anticipated XLR8™ GeForce® GTX 680 2048MB GDDR5 graphics card. A first launch from the NVIDIA® 28nm Kepler family of graphics cards, the PNY GeForce GTX 680 delivers more than just state-of-the-art features and technology. It houses truly game-changing performance that taps into the powerful next-generation GeForce architecture to redefine smooth, seamless, lifelike gaming.